Aluminum Twin Ramps complete with Perforated Traction Grip. Provides a fast, safe means of taking vans, pickup trucks and some passenger cars from ground level into and out of high building entrances. Non-slip use in both wet or dry conditions. This line of aluminum twin ramps compliments our models with Aluminum Treadplate Deck. 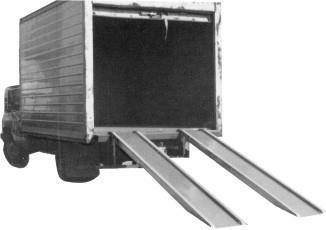 Safety pins are included to secure twin ramps to truck or dock. 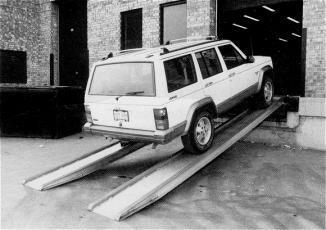 To choose a set of twin ramps please see our TWIN RAMPS SELECTION GUIDE.